First of all, thanks for the use of 'wuzzlesaur'. I had a stuffed Bumblelion myself as a kid. 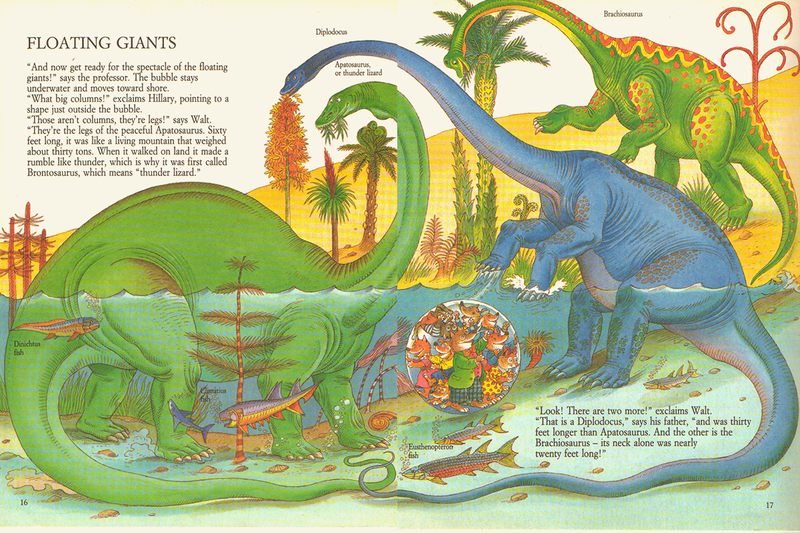 I love how the sauropod page has the Paleozoic fish (including highly misspelled Dinichthys) with Jurassic dinosaurs. Ditto for the misspelled Ambypterus being caught by Hesperornis. Also, the 'Stegocephalus' there has been renamed, as that genus is an amphipod. 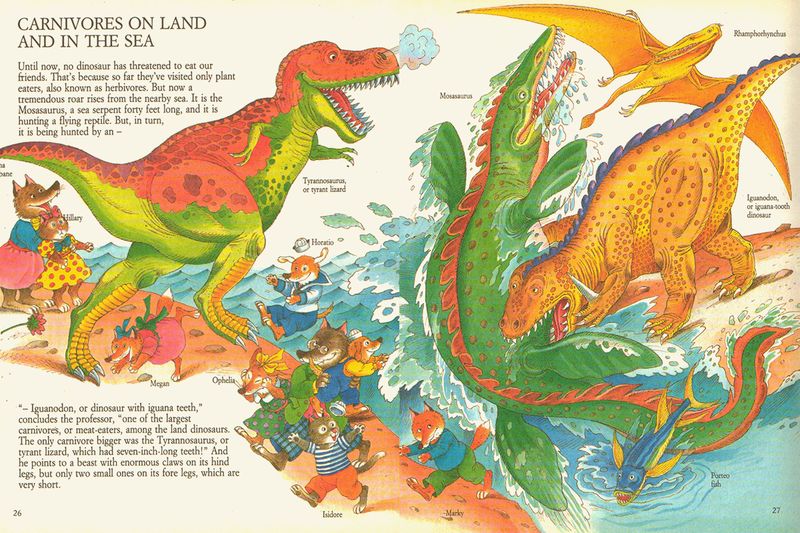 What's the "Porteo fish" by the Iguanodon supposed to be?! Also amusing is how etymologies are only given when they're simple. "Parasaurolophus- near to Saurolophus, no then we'd have to explain what Saurolophus is... uh... 'a crested duckbill dinosaur'- Perfect!" 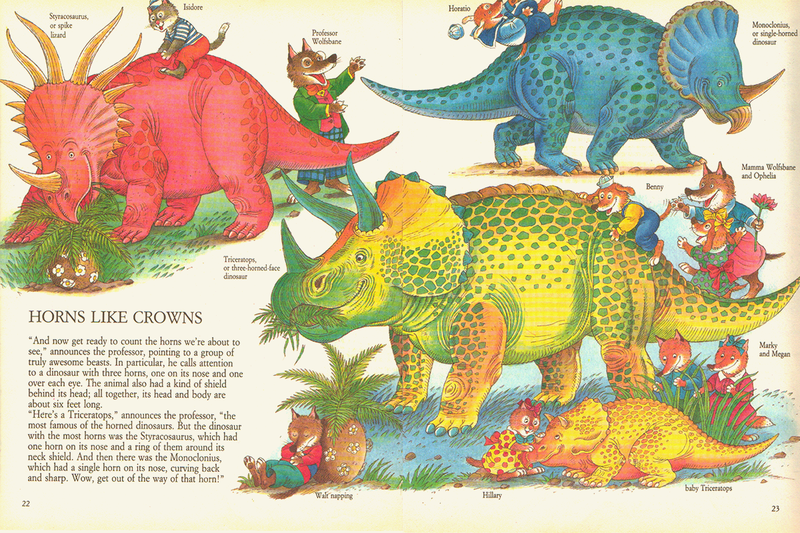 Not that the etymologies of Monoclonius or Stegosaurus are correct anyway. And no, Kentrosaurus was never thought to be toothless. 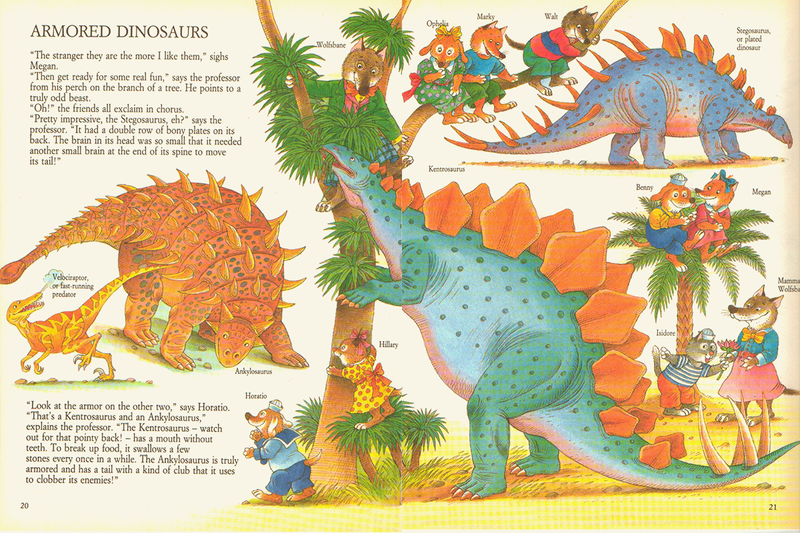 Note they even switched its label with Stegosaurus. Ah, excellent. Thanks for the notes, Mickey, especially the fish clarifications. It's an odd book, for sure, and I wonder if it was translated from Italian, accounting for some of the weird choices in wording. The "Porteo fish" is supposed to be Xiphactinus, historically known as Portheus (again, Italian mistranslation seems to be at work). Looks like a telephone-game-type recreation of a recreation of the Zallinger Life magazine Portheus. 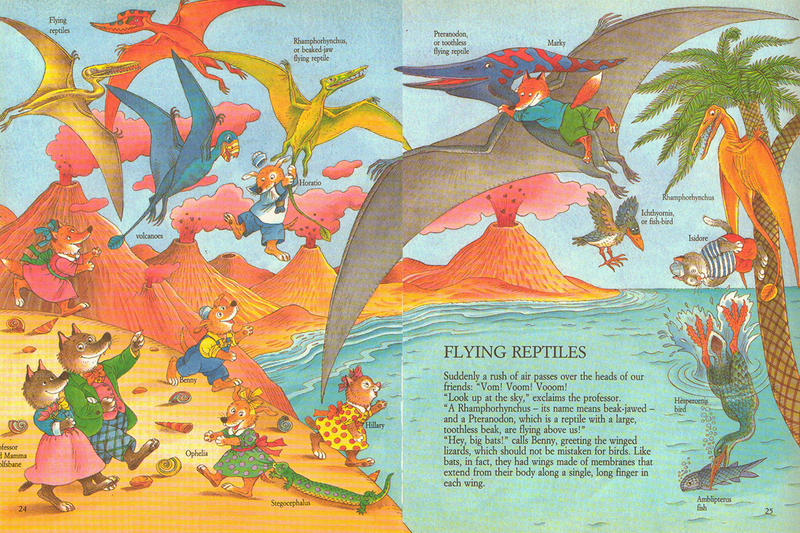 Interesting assortment of sources for the art: the pterosaurs are direct rips from the old MacMillan encyclopedia. The microsaur (labeled "Stegocephalus") mimicking the Coppertone dog below the pterosaurs is straight out of Burian, it should be Microbrachis (presumably they meant "stegocephalian" not the amphipod) Damn big microsaur, but the scale is all over the place anyway--look at the size of that Rhamphorhynchus above Iguanodon! Ah, I didn't know Portheus was a synonym of Xiphactinus. Stegocephalus was a genus of tetrapod referred to in some early 1900s references (e.g. listed as an archegosaurid in Camp, 1940), but I haven't been able to determine what it was eventually renamed to or synonymized with, presumably due to the amphipod preoccupying the name. I really don't think Stegocephalus was ever an amphibian genus, at least no one has formally proposed a new taxon Stegocephalus in Amphibia. 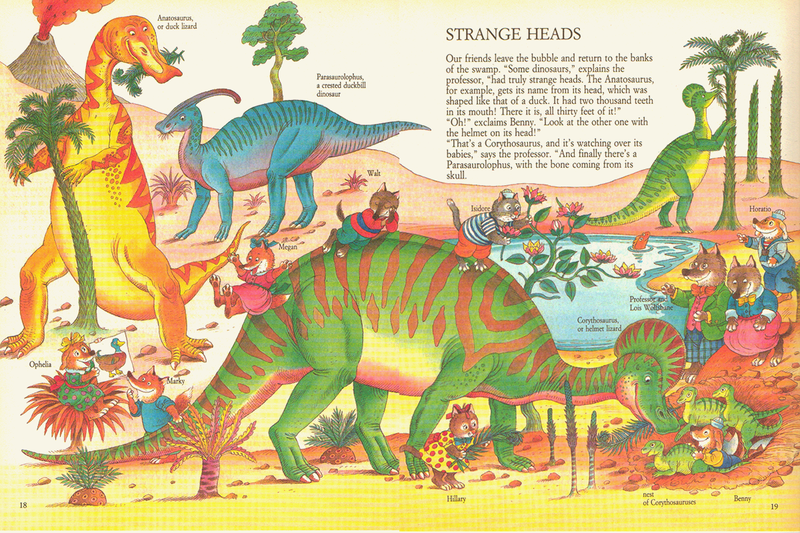 All of those early 1900s mentions are either misspellings or misinterpretations of previous misspellings, usually errors for "stegocephalous" (e.g., Cox, 1876, Annual Report of the Geological Survey of Indiana: which features the line "the character observed in Archegosaurus and other Stegocephaus Batrachia", but even has a corrigendum on pg. 600 stating that "Stegocephalous" was meant). These typos, which look like a generic name, are the sort of thing that are easily absorbed into subsequent big taxon lists like Camp's. That would be interesting, much like the case of "Carnosaurus" and "Coelurosaurus" (Huene, 1929) for dinosaurs. 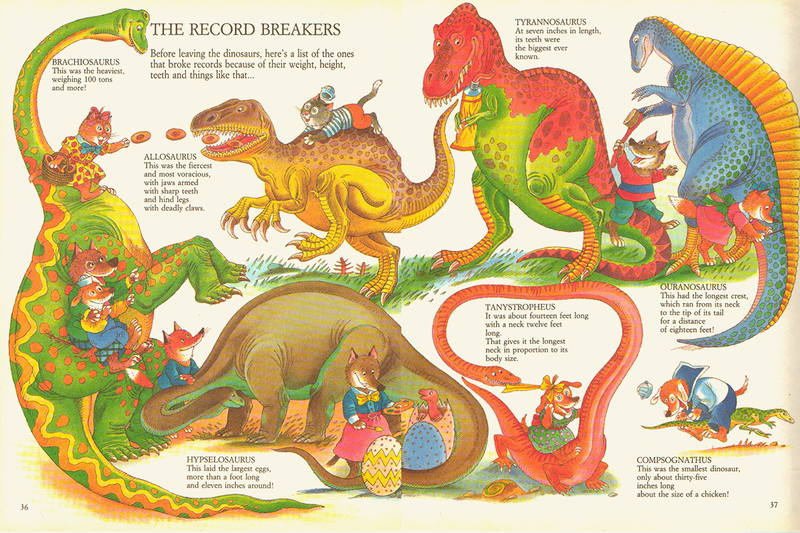 If only we had a copy of "Lehman, J-P., 1955, Les fusions d'os exosqueleettiaues (dermiques) chez les Stegocephalus. Compte rendu hebdomadaire des seances de l’Academie des Sciences Paris, v.241, p. 1154-1157." to see what the issue was there. I recognize this art style. 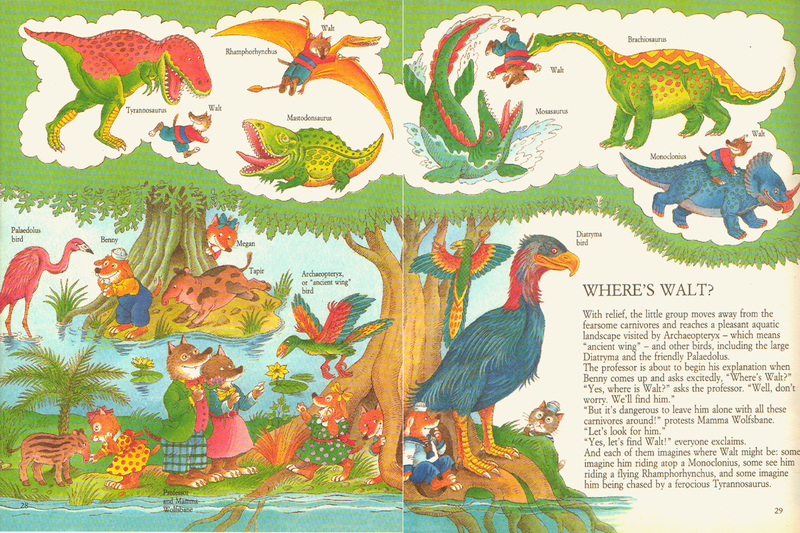 I've got a little book which I adored as a child, called 366 Animal Fables, all about well little folktales collected from around the world, and excerpts from larger stories from all corners of the world. 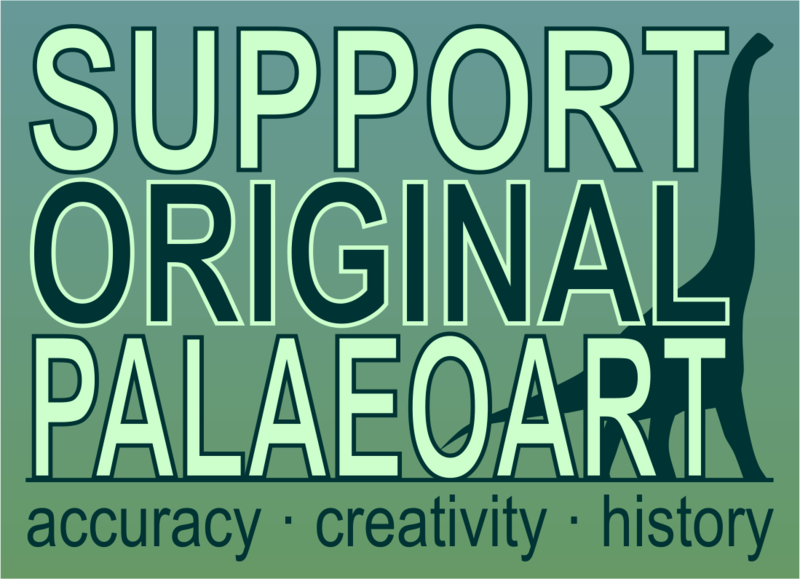 I was pursuing this site the other day when I came across this entry and the request for other images of carnivorous Iguanodons. After think about it I realized today where I had previously encountered such a depiction: Marvel Comic's Devil Dinosaur #2 (Pub. May 1978). Here Iguanodon is depicted and described as "a beast to be reckoned with" as well as "a living engine of destruction and eager to prove it" with his "snapping jaws" that "answer to the call of his age - attack and destroy!" This "savage" Iguanodon attacks the titular Devil Dinosaur - a red T-Rex - unprovoked but is, of course, soundly defeated by the series' saurian hero. I remember Devil Dinosaur- it was by the Great Jack Kirby and was the first comic that I bought more than one copy, for "investment purposes". As I recall, "Devil" was red because he fell in lava.